Since 2006, Green River Adventures has strived to provide an unforgettable outdoor experience with top notch customer service as its core value. With our roots based in kayak instruction and outdoor education, we have evolved into a full adventure business providing everything from Inflatable Kayak river trips to our unique Waterfall Rappel and Hiking experiences. We have activities for all ages and activity levels. From the adrenaline junky to families looking for a mellow experience, there’s a trip for everyone. Come visit us and let us take you on the adventure of a lifetime! Saluda is famous for being the crest of the steepest, main line railroad grade in the United States. Although the train no longer runs through Saluda, it’s impossible to separate Saluda from it’s railroad history. 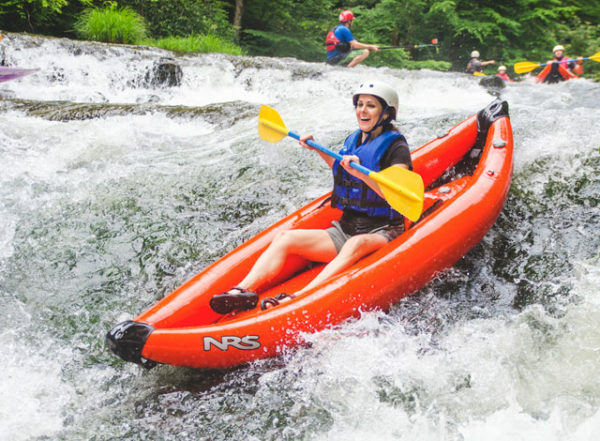 Now a quiet mountain getaway, Saluda is surrounded by protected lands that offer an abundance of outdoor activities including whitewater kayaking, hiking, fly fishing, mountain biking, road biking, rappelling, canyoneering, and rock climbing. The Historic Downtown also offers plenty of authentic craft shops, restaurants, annual events, and live music throughout the year. Learn more about this charming town at Saluda.com. Looking for a place to stay? Check out some of our favorites here at GreenRiverGorge.com.